Okay, there’s no feta in this bread. But there is plenty of black olive, red onion, and mint. And man, would it ever be delicious served with a tangy block of feta! Or, for a truly decadent treat, you could form the loaf into a baguette shape, and broil slices topped with feta until it goes all melty and golden-brown. Opa! 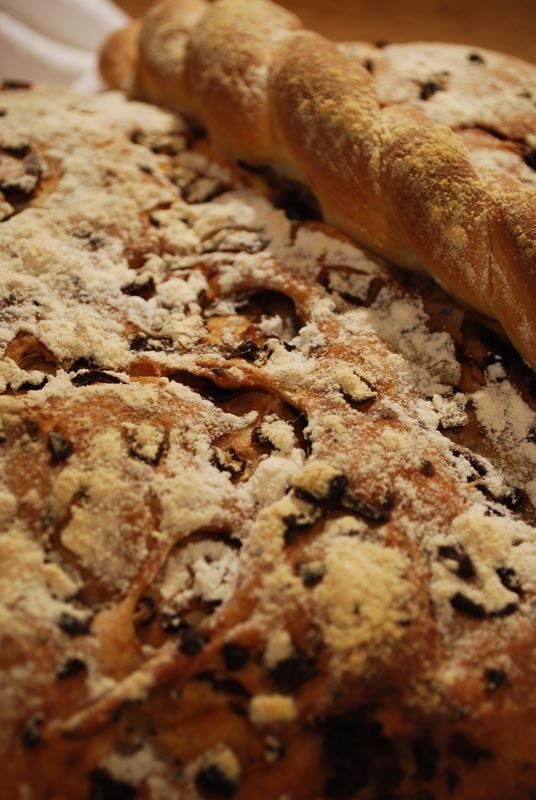 This bread, called Elioti in Greek, is a Cypriot bread once served primarily at Lent, but now is made year-round. It’s traditionally filled with onion (usually red), olives of any sort, and an herb, either cilantro, mint, or a combination. Parsley is sometimes used, and would be a perfect substitute if you cannot abide cilantro. Personally, I like the depth of flavor that a mixture of herbs provides, so I’ve written the recipe here with mint and cilantro. But if you’re a purist and insist on keeping your herbs solo, I assure you, it will be just as delicious. Any kind of olive will do, but Kalamata are ideal for this purpose. I’ve chosen to go with cured olives, mainly because I had them in the fridge, but also because I absolutely love their massive pop of flavor. Just be sure to chop them finely, so they distribute more evenly throughout the dough. I’ve found that in breadmaking, the less flour you can add to a dough, the better, since moisture in the dough means more steam (and rising) in the oven heat. It also makes for a more tender, moister bread, generally speaking. But with this bread, you don’t have to worry too much about that. See, in baking, the raw red onion breaks down within the bread, releasing additional moisture. That doesn’t exactly mean you can turn an overly-stiff dough into a work of culinary genius, but it does go a long way towards rescuing a not-quite-perfect dough. And if you can get the balance just right (it’s not too hard), you end up with a chewy, crusty bread that’s as tender inside as any coffee cake. 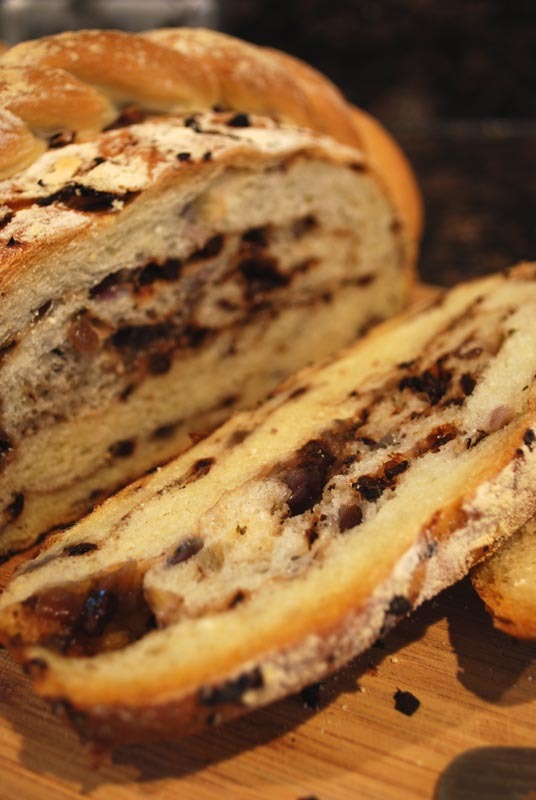 Speaking of coffee cake, slices of this bread actually do look a bit like a piece of cinnamon-swirled coffee cake, because of all the color from the red onion and black olive. But one bite will have your palate in a heaven of savory flavors, salty with the bits of olive, and almost sweet from the onions just about to caramelize. The herbs lend a fragrant, earthy tone that sets off the other ingredients wonderfully, not to mention the fruity olive oil flavor from the dough itself. Tender, crusty, olive-y, minty… there’s just one word for it all: Opa! 1. Reserve 2 to 3 ounces (about 1/2 cup) of the flour; set aside. In the bowl of a stand mixer, whisk together the remaining flour, salt, and yeast. Add the hot water and olive oil. Using the dough hook, mix at low speed until a shaggy dough forms. Increase the speed to medium and knead until smooth and elastic, about 8 minutes. Add the reserved flour as needed to achieve the proper consistency; the dough should clear the sides of the bowl. 2. Transfer the dough to a lightly-oiled bowl, turning to coat all sides. Cover with plastic wrap and let rise in a warm place until doubled in size, about 1 hour. 3. Turn the dough out onto a lightly-floured surface and punch down. Cut off a corner of the dough (about 1/8 of the volume), pat into an elongated shape, cover, and set aside. 4. Lightly roll the remainder of the dough into a large round, as big as the dough will easily stretch. Sprinkle the onion, olives, and herbs evenly over the surface. Bring the sides of the round into the middle, and knead until the ingredients are evenly incorporated. (The dough may tear, spilling the mix-ins. Just keep kneading until it’s all mostly in the dough, adding a little extra flour as needed to keep the dough from sticking.) Shape the dough into an oval loaf, and transfer to a baking sheet lined with parchment paper. 5. Divide the reserved dough lengthwise into two equal pieces. Roll each out into a long rope, about 16 inches long, or as long as the dough will easily stretch. Twist the two together into a single rope. Cut the twisted rope in half, and pinch the ends to seal. Drape each piece decoratively over the loaf on the baking sheet, tucking the ends under the loaf to keep in place. Cover with lightly oiled plastic wrap and let rise in a warm place for 45 minutes, or until almost doubled in size. 6. Preheat the oven to 400º F. Dust flour over the loaf, and bake for 40 to 45 minutes, or until golden brown, and baked through. Transfer to a wire rack to cool. 1. Be sure to use oil-cured olives, as their robust flavor makes the bread. If you simply can’t find them, plain black olives will work instead; just increase the amount to 1 cup. If you absolutely must use jarred or canned, a 4 ounce container should do it. 2. If using active-dry yeast, heat the water to 105º to 115º F. Stir the yeast into half of the water, and let sit until foamy, about 5 to 10 minutes. Add the remaining water and olive oil, and mix with the flour and salt as directed. 3. The decorative twists (step 5) certainly aren’t mandatory, but they do lend a certain celebratory air to the loaf. Plus, I think they’re kind of cute.